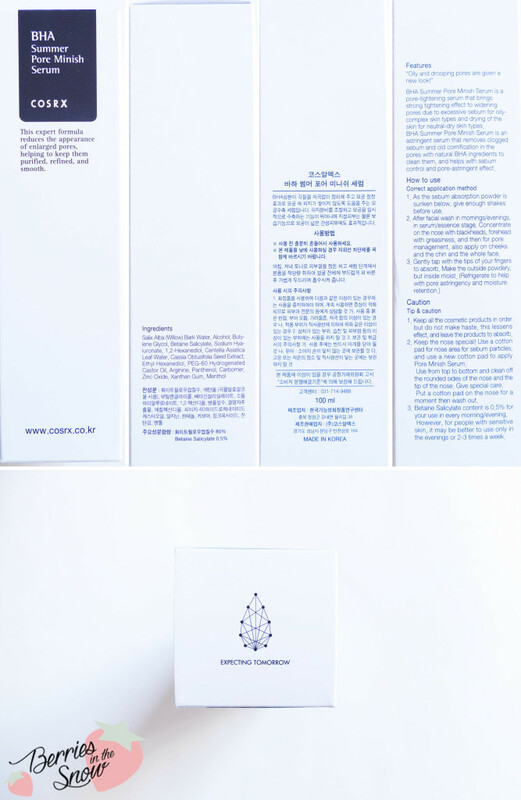 COSRX is a affordable Korean brand “offering good quality beauty items for 10 years”. The brand name is composed of COS for cosmetics and RX for prescription. Brand like Ciracle and C20 (yes, the famous vitamin C serum) are also part of COSRX. 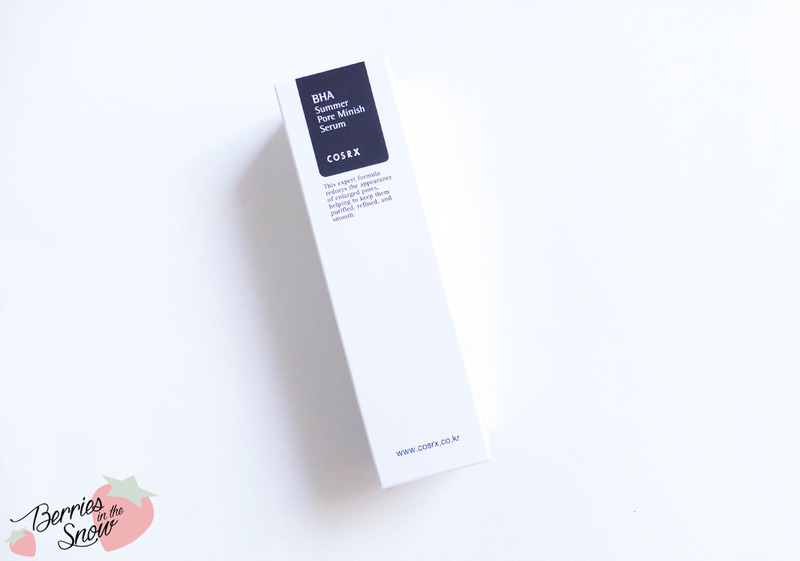 One of the rather popular skincare lines from COSRX are the AHA/BHA skincare products. I’m using the COSRX BHA Summer Pore Minish Serum in combination with the COSRX AHA/BHA Clarifying Treatment Toner I reviewed previously. The packaging design of all the COSRX products is simple and similar. They all come in a white cardboard box with a black area where the product name is written in. The rest of the cardboard box contains very detailled descriptions in English and Korean. You can click on the image below to enlarge and read the description. 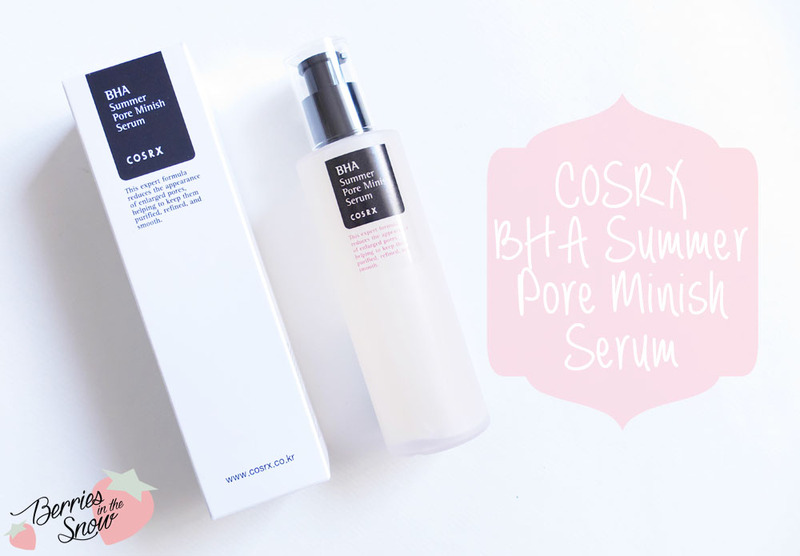 The cardboard description also contains the rather short ingredient list of the COSRX BHA Summer Pore Minish Serum. The ingredients are also listed on COSDNA, if you want to check upon them >>here<<. The main ingredient of this astringent serum is White Willow water, which makes 80 % of the ingredients. Since it is an astringent serum for removing the sebum from clogged pores the second ingredient is alcohol, but although I have dry skin and usually too much alcohol in products makes my skin feel irritated I don’t have that feeling here. I focus for the application on my T-zone mainly, too. The Beta salicylate, the BHA, makes 0.5 % of the ingredients, and helps to exfoliate the troubled areas and smoothen the skin. Condition for the BHA to work is a low pH. The serum itself has a pH of 6-7 according to my meassurement, it says 7 on Wishtrend. Therefore it is important to use a preparation toner with a low pH before. Apart from these ingredients the COSRX BHA Summer Pore Minish Serum contains Hyaluronic acid for moisturization and Zinc Oxide for UV protection. Nevertheless, you should keep using sunscreen during daytime when using BHA/AHA products! 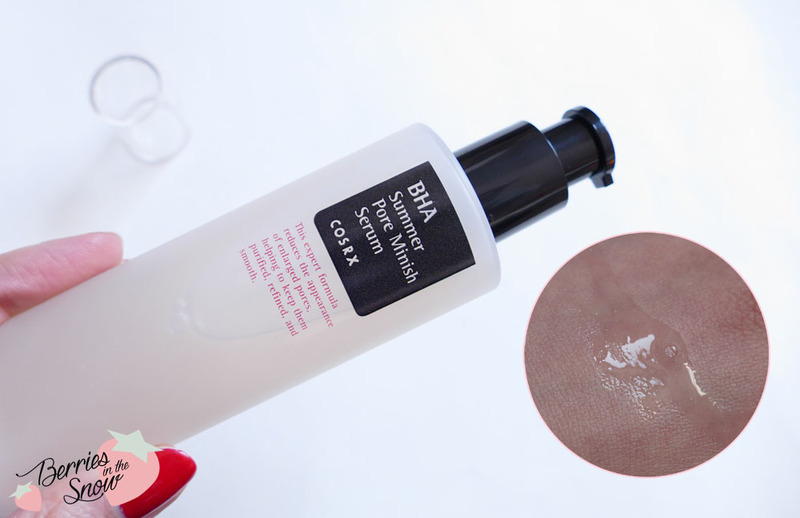 The COSRX BHA Summer Pore Minish Serum contains 100 ml in a pump bottle made of sturdy, frosted plastic. You see an orangy liquid through the bottle. When you receive it, you will notice floating white particles in the liquid and some white residue on the bottom of the bottle. This is the sebum absorption powder as stated in the description and you have to shake the bottle before every use of the serum, so the powder dissolves in the solution. The serum is made for all skintypes for daily use in the morning and evening, but if you have very sensitive skin COSRX suggests to only use it in the evening and 2-3 times a week. Since it is an astringent serum to remove oil and clogged pores I use a cotton pad to swipe the serum over my target areas. It is important to also leave the product until it is fully absorbed, so the effect of the ingredients is not weakened. 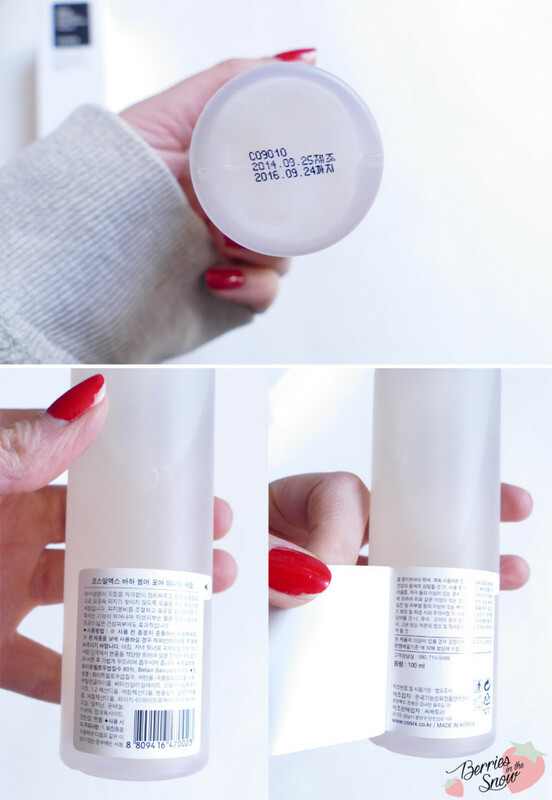 The bottom of the bottle has the production and the expiration date printed on and you will find further Korean description on the body label of the bottle and below the sticker. The serum has a shelf-life of 12 months. I use a couple of pumps on my cotton pads while applying the serum. The serum has a clear, runny consistency and a light alcohol-scent which dissapears super quickly and leaves a scentless finish. The serum absorbs quickly, too, and is not sticky. The immediat effect of the COSRX BHA Summer Pore Minish Serum is definetly the deep cleanse of the pores. Even after double cleansing this astringent serum shows some dirt on the cotton pad used. The area around my nose looks cleared up and the pores look less visible, which is only ahort time effect. But what about longterm effects of this serum? As I said at the beginning, I did not use this product religiously day and night, but I’d say I used it for around 50 days in total, maybe more. I’m half-through the bottle now. 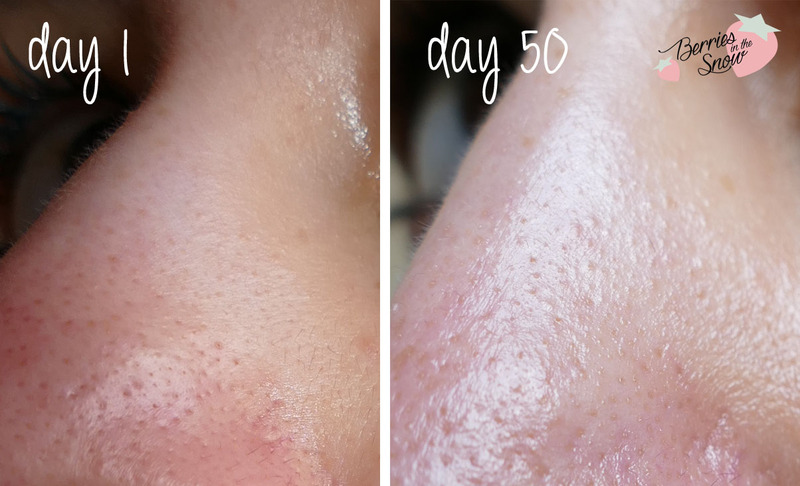 Below you can see a closeup of my nose starting from the first day I used it up to today. Despite the different lightening conditions you can see that the pores appear less deep. From only looking at the mirror I thought there are no huge changes, but seeing the closeup convinced me, that if used regulary I’m sure that the effects are even better to see. At the moment I do not use any other BHA/AHA products apart from this serum and the Treatment Toner, but I want to start using Mizon AHA serum in the evenings now. Let’s see how all the three (together with my OST Vitamin C serum) work together. The COSRX BHA Summer Pore Minish clearly fulfills its purpose as astringent serum for deep cleansing pores. It immedieatelly makes the pores appear smaller and clearer and even on longterm you can see some changes. If used regulary day and night I’m sure the results will be even more visible. I’d say this is a good BHA serum for people with sensitive skin to start with. I’m in love with it and so far it fits nicely into my skincare routine. Let’s see how it works in combination with a stronger AHA serum and if I will keep repurchasing it or not. 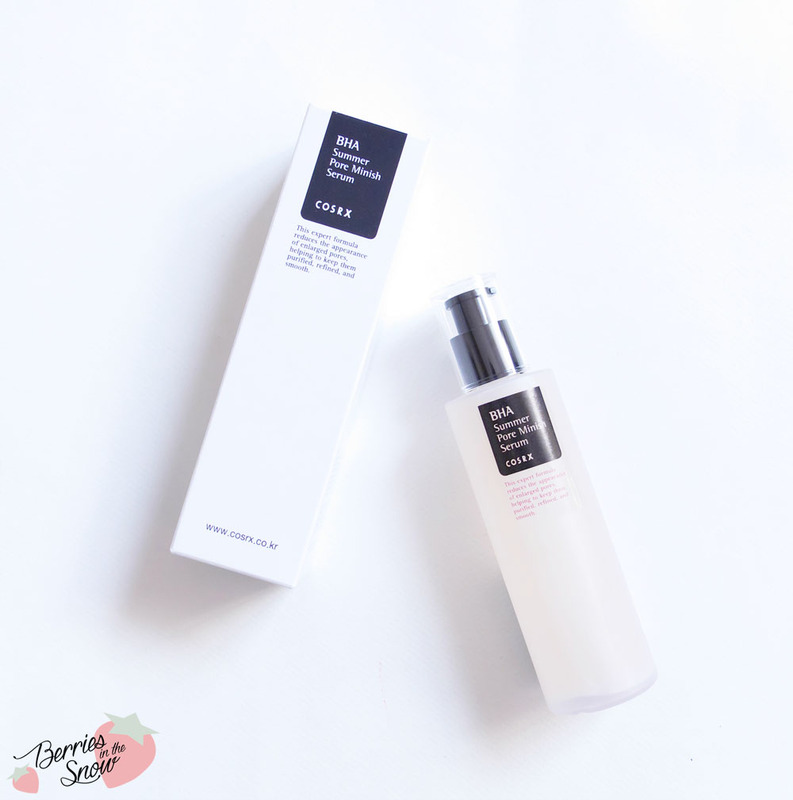 You can get the COSRX BHA Summer Poire Minish Serum with a volume of 100 ml from Wishtrend for 13.80 US$. It seems the product is currently out of stock! Check out my other reviews for COSRX products >>here<<. Evelyn last post…El Ph de la piel, Limpiadores testeados y lista de limpiadores dañinos. I’ve bought the BHA blackheads power liquid and I hope it will work as well! Your reviews are always so detailed! Memebox just put together a Cosrx box and this item is inside. So, I think I might go for it! My skin also has enlarged pores and I have always struggled with oiliness and blackheads. Wow your pores look so much cleaner! Not that they were bad before, but they look better now. I must give this product a look, my pores need it! I was really hoping this would be as good as every other Cosrx product I’ve tried. I’m glad to see that’s the case! I’ve seen this posted several times and it seems to be working great! Now I wanted to get this as well!